Olivia Mehaffey (left) with Lynn McCool, Director of Golf at Lough Erne Resort.As Graeme McDowell prepared to do battle in the RBC Heritage and Mourne’s Reeve Whitson got ready for his European Tour bow in the Spanish Open, Royal County Down’s Olivia Mehaffey claimed overall victory in the Faldo Series Ireland Championship at Lough Erne. 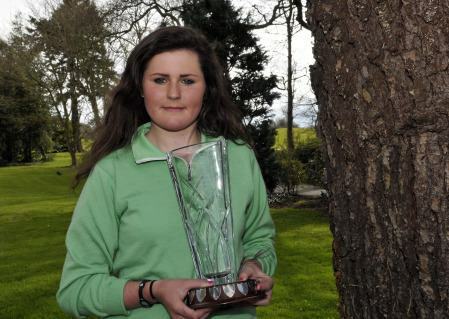 The 15-year old Ulster star shot a pair of level par 72s to win by two strokes from Castle’s Ross McKeever and secure her place in the 17th Faldo Series Grand Final later this year. Olivia Mehaffey won the sixth Faldo Series Ireland Championship by two shots with consecutive rounds of 72 over the Faldo Course at Lough Erne Resort in Northern Ireland. The Ireland girls’ squad member beat 134 competitors to the title, the largest ever field for the event. Mehaffey will be joined at the 17th Faldo Series Grand Final by Boys’ Under-18 winner Karl McCormack from Portarlington, who won a three-way play-off to qualify for the 54-hole World Amateur Golf Ranking event, hosted by Faldo at the end of the season. Mehaffey cruised to victory in the Girls Under 16 section with the Boys Under 16 title going to McKeever, who shot a pair of 73s to win by two shots from Belvoir Park’s Marc Norton. Portarlington’s McCormack (73-76) won the Boys Under 18 title after a two hole play-off with Conor Stone and Jamie Fletcher after they finished on five over par 149 while Skibbereen’s Kieran Lynch (76-75) added another Faldo Series title to his collection with a four-stroke win in the Boys Under 21 section. The Heath’s Mary Doyle shot a superb 71 and took the Girls Under 21 medal from Ariana Coyle Diaz. Meanwhile at El Saler near Valencia, Spanish Amateur Open winner Whitson will tee it up with Spain’s Gerard Piris Mateu and American Peter Uihlein in the Open de España. The event marks the return to action of veteran Miguel Angel Jimenez, 49, who broke his leg in a skiing accident in December. “My leg is improving daily,” Jimenez said. “I work out every morning in the gym and I’m actually a little ahead of schedule on my rehab. I am not one hundred per cent fit, but I want to test myself and see how I feel. Whitson is joined in Spain by Shane Lowry, Michael Hoey, former Spanish Open winner Peter Lawrie, Damien McGrane, Gareth Maybin and Q-School graduate David Higgins. If you're hoping to follow in the footsteps of Rory McIlroy and Stephanie Meadow and make your mark on the Faldo Series it's crucial to enter. And while this year's Faldo Series Ireland Championship at Lough Erne is nearly two months away, entries close this Friday, March 6. Dun Laoghaire's Ted Collins begins his defence of the Faldo Series Ireland Championship at Lough Erne Resort in County Fermanagh on Tuesday. 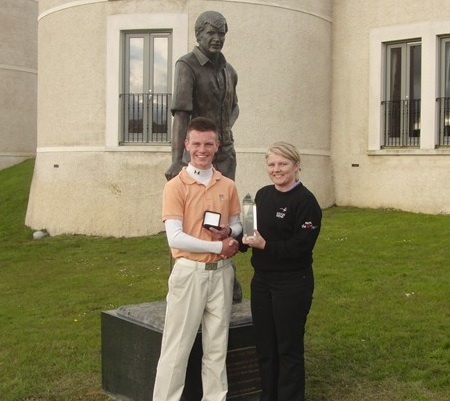 Rowan Lester (left) with Lynn McCool, Director of Golf at Lough Erne Resort.Hermitage talent Rowan Lester won the fifth Faldo Series Ireland Championship by two shots after rounds of 71 and 70 at Lough Erne Resort in Northern Ireland. The 16-year-old Ireland squad member beat 120 competitors to the title, the largest ever field for the event. Assaf Cohen of Israel salutes the crowd during the 16th Faldo Series Grand Final at Lough Erne Resort in Northern Ireland.Hermitage’s Rowan Lester is three strokes behind Assaf Cohen of Israel entering the final round of the Faldo Series Grand Final at Lough Erne Resort in Co Fermanagh. 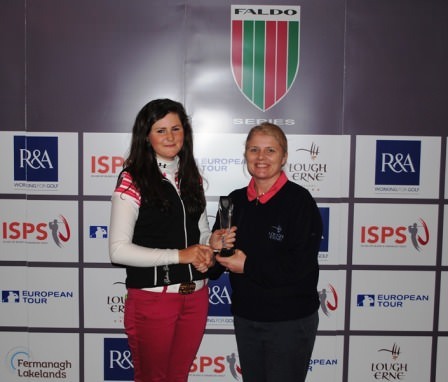 Olivia Mehaffey continued her magnificent season with victory at Roganstown. Picture Pat Cashman/www.cashmanphotography.ieOlivia Mehaffey overcame a mid-round wobble to complete a memorable week with victory in the Irish Girls Open Stroke Play Championship at Roganstown Golf & Country Club.